Hello! 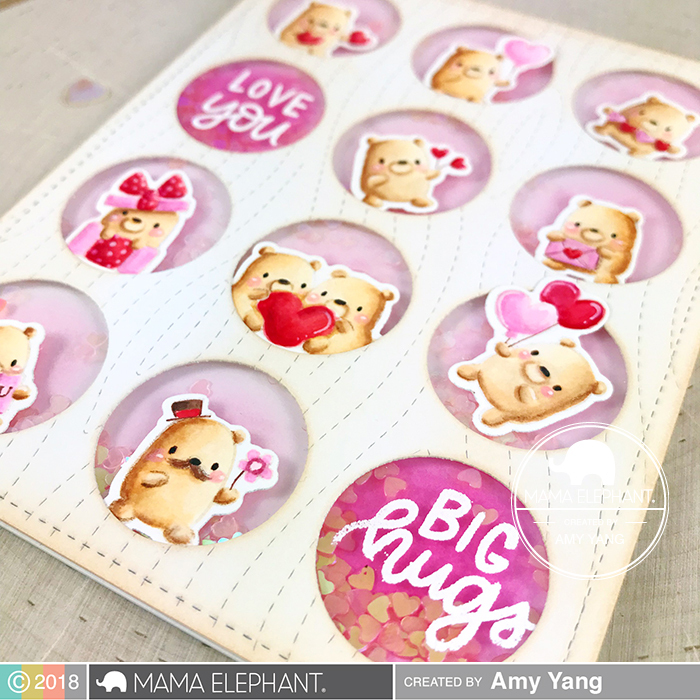 I have a fun designer series project featuring the super cute Little Bear Agenda set over at the Mama Elephant blog today. Go check it out!! 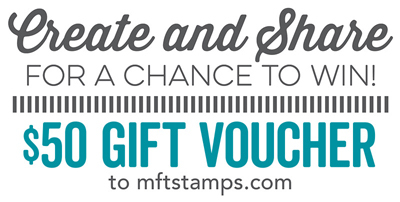 :) Happy stamping! As you can see, I turned the sketch around and those cute birds represent the five squares. To make this scene, I combined three different stamp sets. The brown birds are from the You Make My Heart Spin, the two owls are from the You Make My Heart Melt. 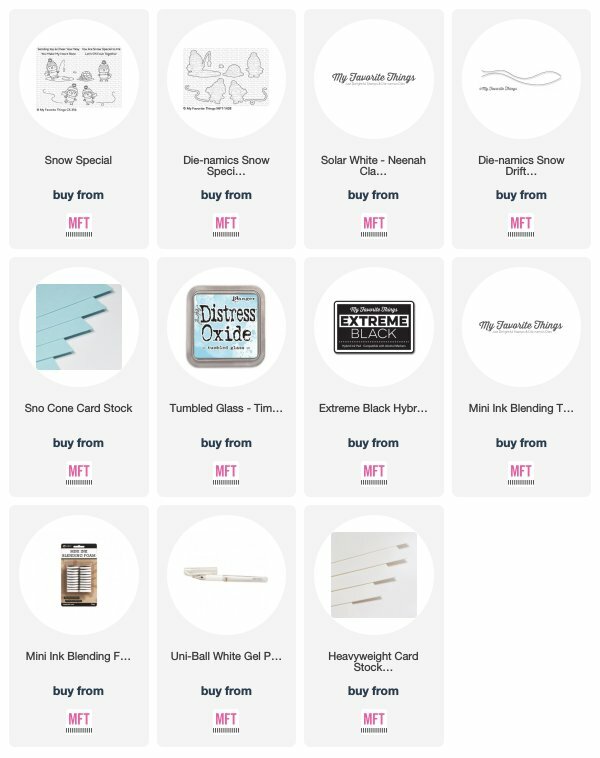 The were Copic colored and cut out with the coordinating dies. The trees are from the SY Warm and Feathered Hugs and I stamped them with Milk Cholate Hybrid Ink. The front panel was ink blended with Distress Oxides. After, I sprayed the panel with water using a mini mister. Once dried, I white heat embossed the sentiment from the SY Warm and Feathered Hugs. The hill panel was die-cut using a die from the Snow Drifts Die-namics. I ink blended the bottom of the panel to make the ice skating area. 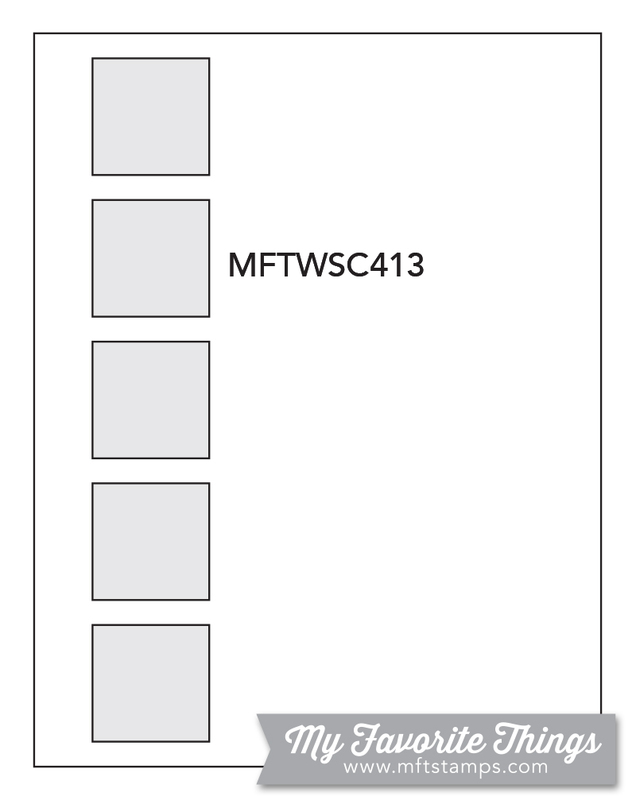 To assemble the card, I adhered the hill panel to the front panel and added the images as shown. 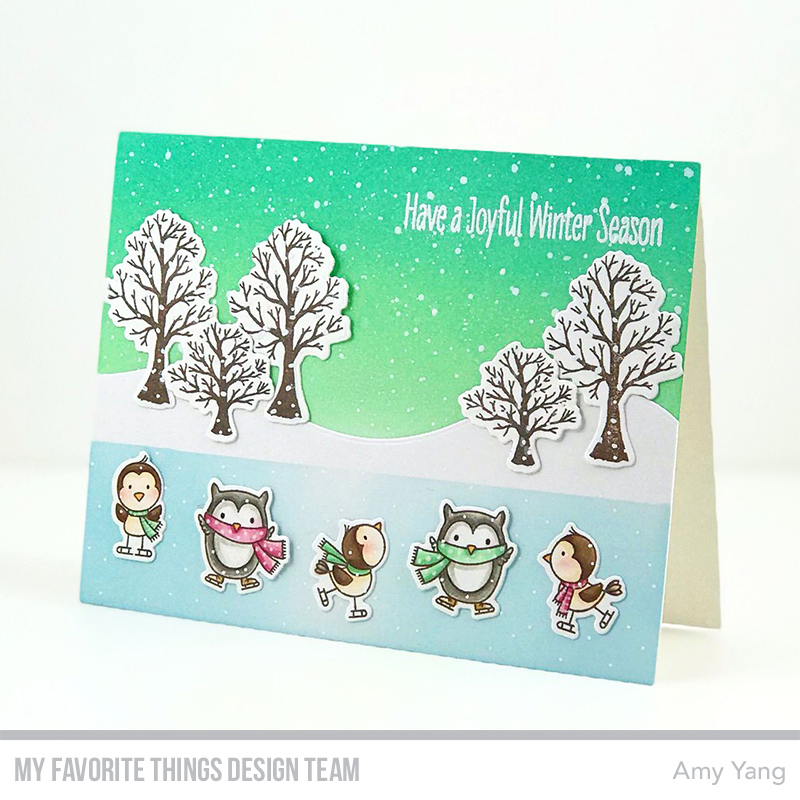 To finish, I added splatters of white paint to the card front to make it look like it's snowing. 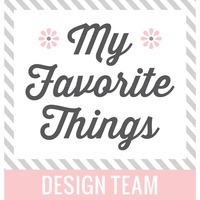 Hello and welcome to the MFT November Hits and Highlights challenge for the design team. 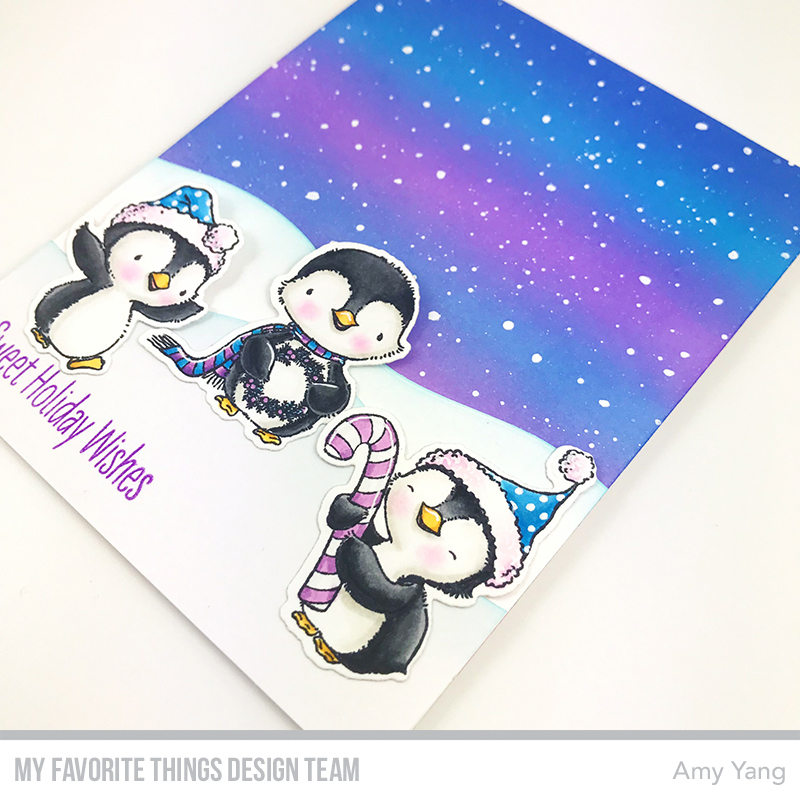 My card today features the adorable SY Sweet Holiday Penguins set. 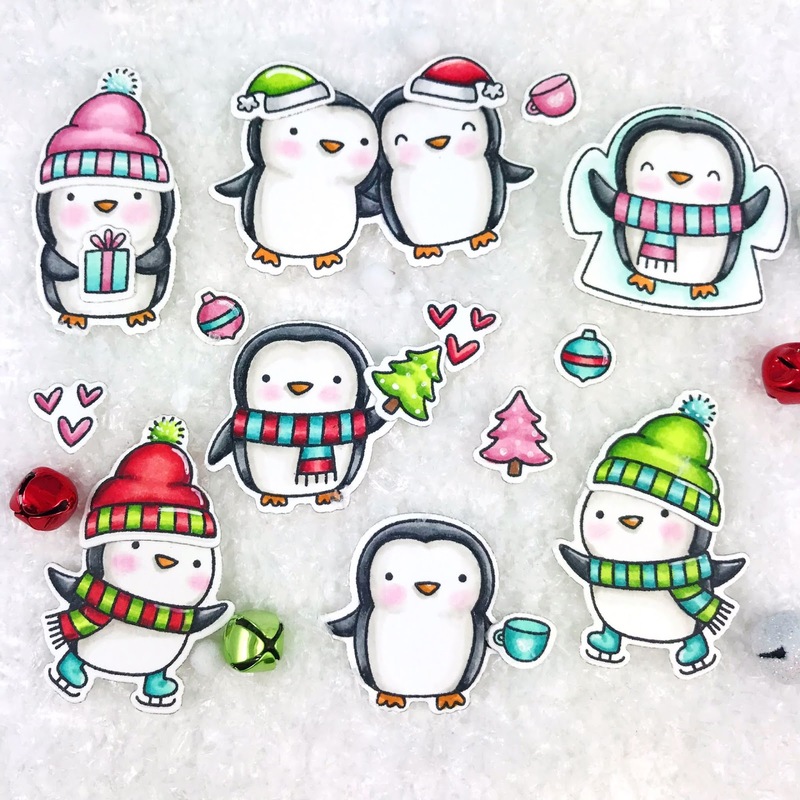 To begin, I Copic colored the stamped penguins from the SY Sweet Holiday Penguins set and cut them out with the coordinating dies. The front panel was ink blended with Distress oxides. To add texture I used the Mini Mister and added splatters of white paint to create the snow. The hill panels were die-cut with the Snow Drifts Die-namics. 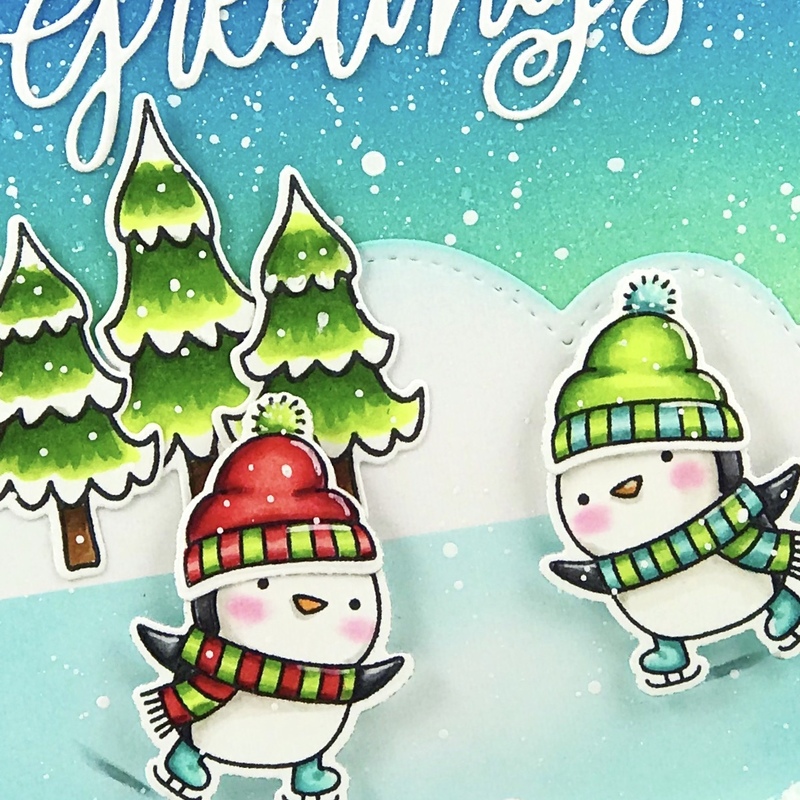 I stamped the sentiment from the SY Sweet Holiday Penguins set on the shorter hill. To finish, I adhered the hill panels and the colored images as shown. 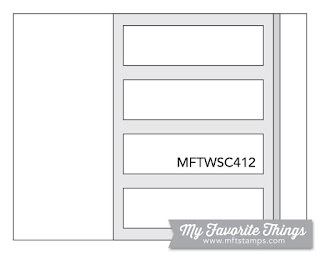 Hello and welcome to the Mama Elephant last November release Stamp Highlight! 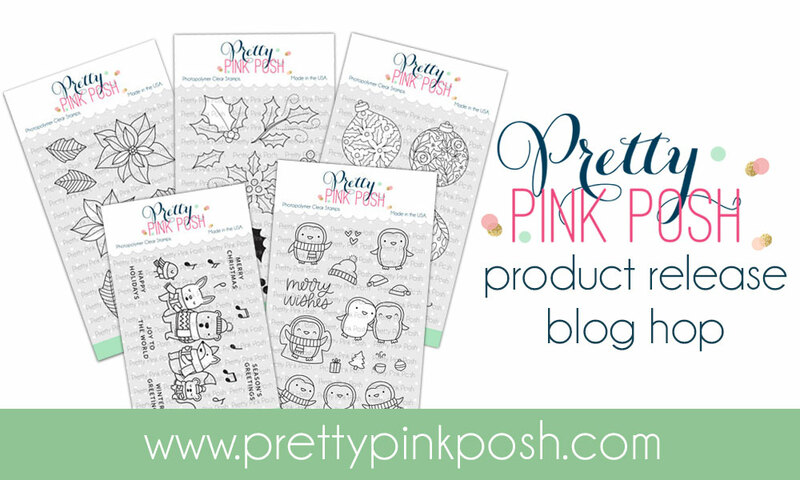 Today, the design team is highlighting the sweet and adorable Hogs and Kisses stamp set. 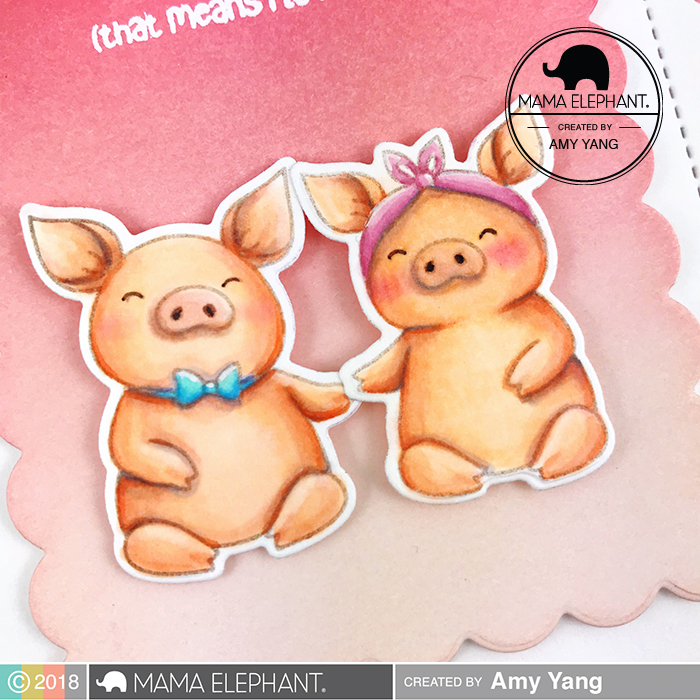 To begin, I did no-line Copic coloring on the pig from the Hogs and Kisses stamp set and cut it out with the coordinating Hogs and Kisses creative cuts. The front panel was die-cut with the second largest die from the Basic Rectangles creative cuts for a nice stitched detail. I ink blended the panel with Distress Oxides and stenciled on the heart using the same colors. 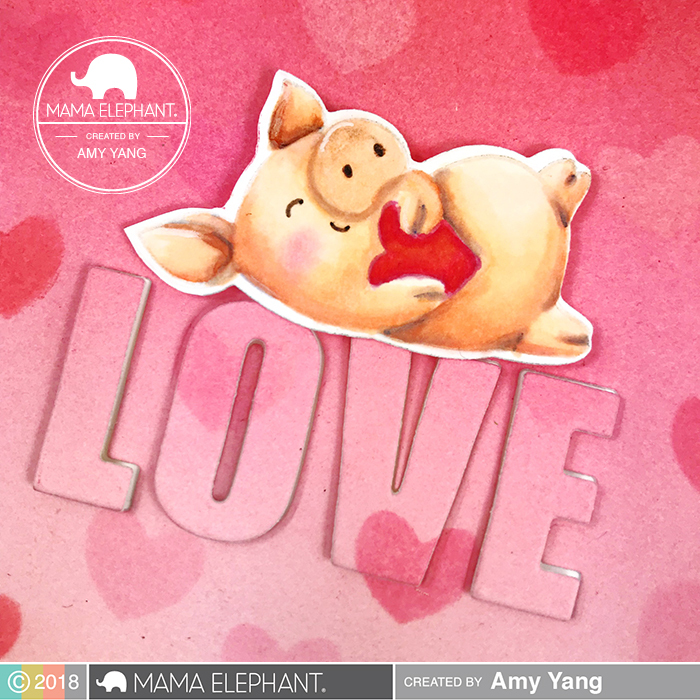 I made the stencil by die-cutting a small piece of acetate using a heart die from my Mama Elephant collection. After, I die-cut the panel with the "Love" die from the Tri Window Cover creative cuts. To finish, I adhered the front panel to a top folding A2 sized card base and foam mounted the die-cut "Love" back into the negative space and foam mounted the pig as well. Thank you for visiting me! I hope you enjoyed my project. 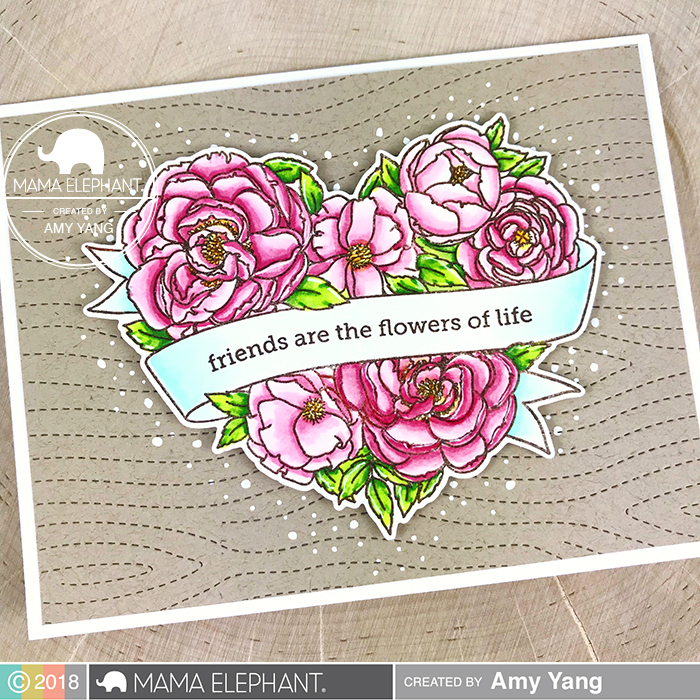 Visit the Mama Elephant blog to check out what the rest of the talented design team has come up with using the Hogs and Kisses stamp sets. 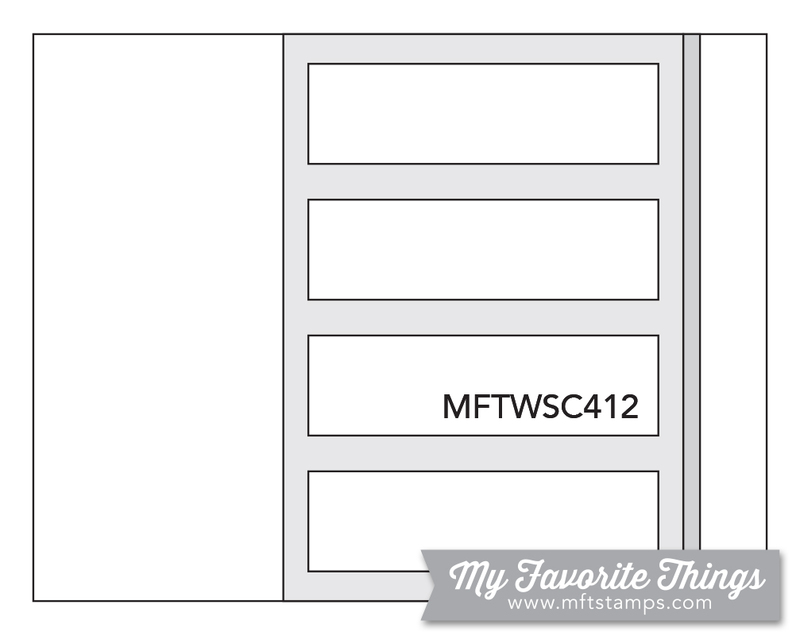 Hello and welcome to the Mama Elephant November release Stamp Highlight! 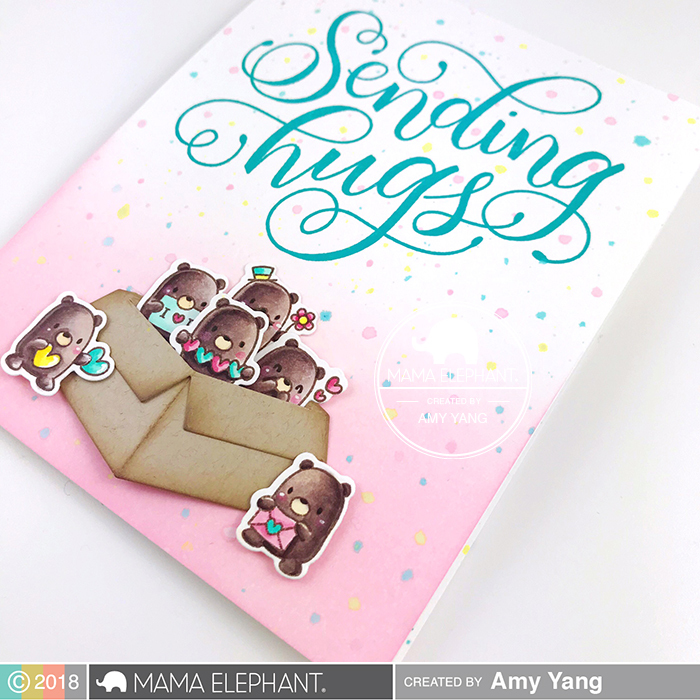 Today, the design team is highlighting the sweet hand-lettered Sending Hugs stamp set. 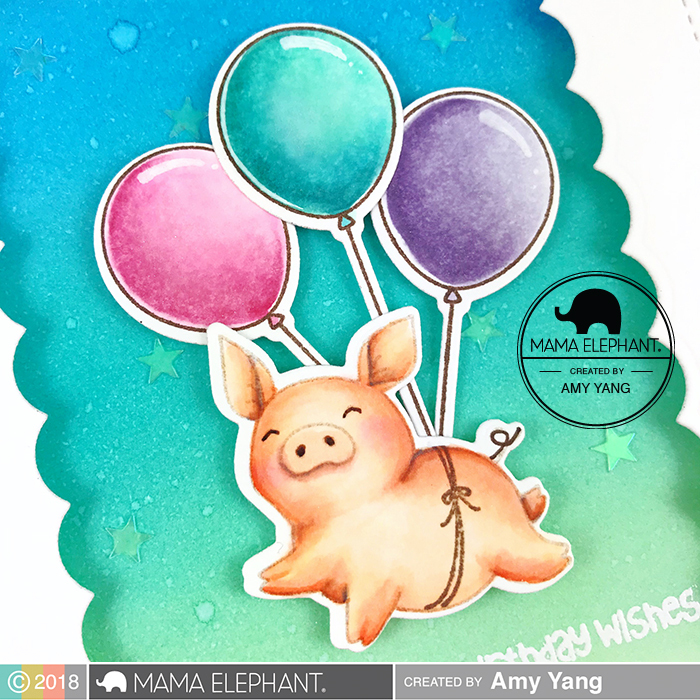 To begin, I Copic colored the adorable critter images with balloons from the Little Agenda sets and cut them out with the coordinating creative cuts. The front panel was die-cut with the die from Cloud Nine Creative Cuts to create the wavy borders. After, I white heat embossed the large sentiment from Sending Hugs stamp set and ink blended it with Distress Oxides. To add texture, I added splatters of water, white paint, and ink. To finish, I foam mounted the colored images and added few sequins for a little bit of sparkle and interest. 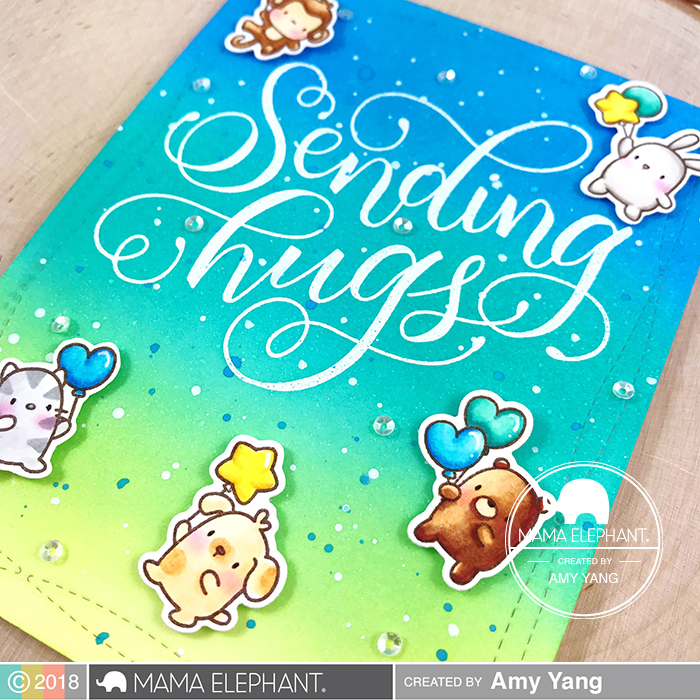 Visit the Mama Elephant blog to check out what the rest of the talented design team has come up with using the Sending Hugs stamp sets. My card inspired by the new sketch. 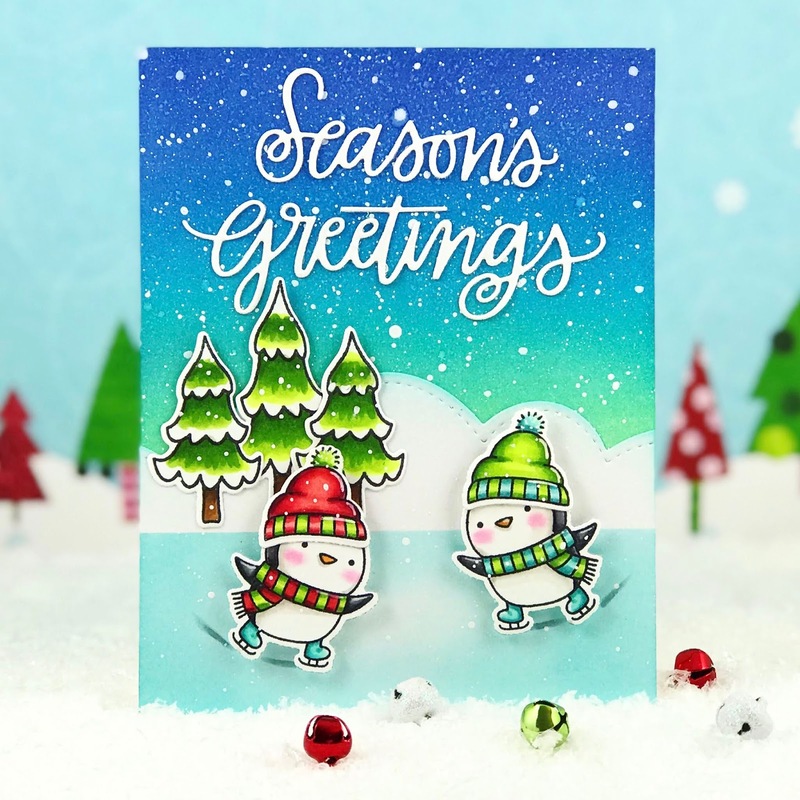 It features the adorable Snow Special stamp set. 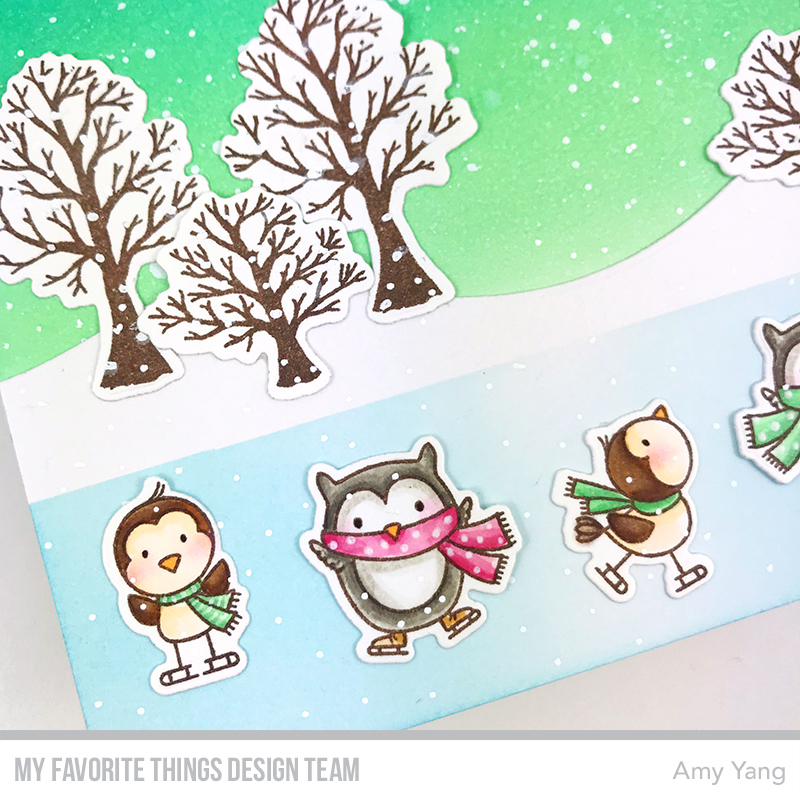 To begin, I Copic colored the stamped images from the Snow Special stamp set and cut them out with the coordinating dies. The hills on the front panel were inspired by the sketch and I used the Snow Drifts Die-namics to cut them out. After, I adhered the hill panels onto a trimmed A2 sized Snow Cone cardstock. 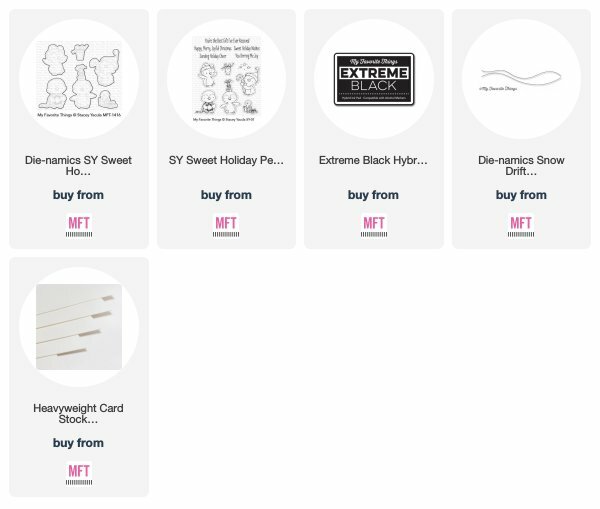 To finish, I adhered the colored images to the card front as shown. 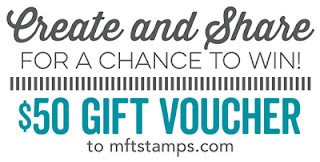 Hello and welcome to the Mama Elephant November release Stamp Highlight! 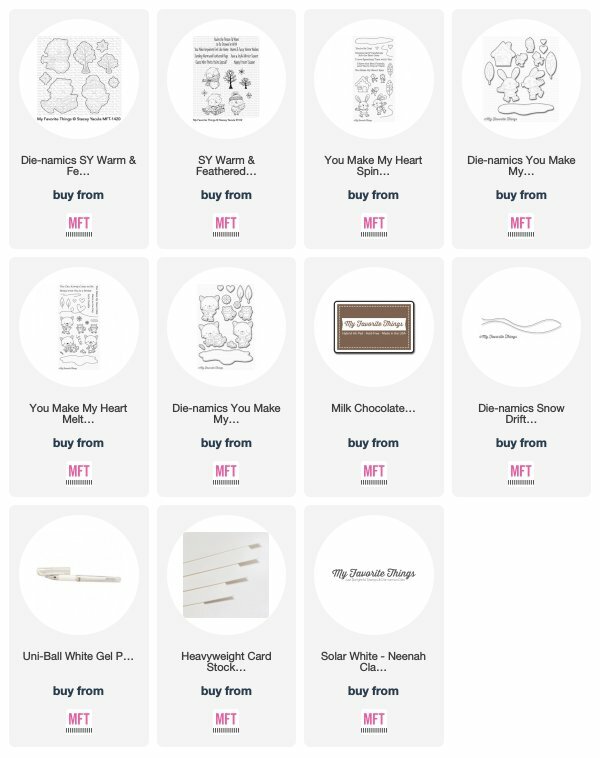 Today, the design team is highlighting the beautiful Heart in Bloom stamp set. 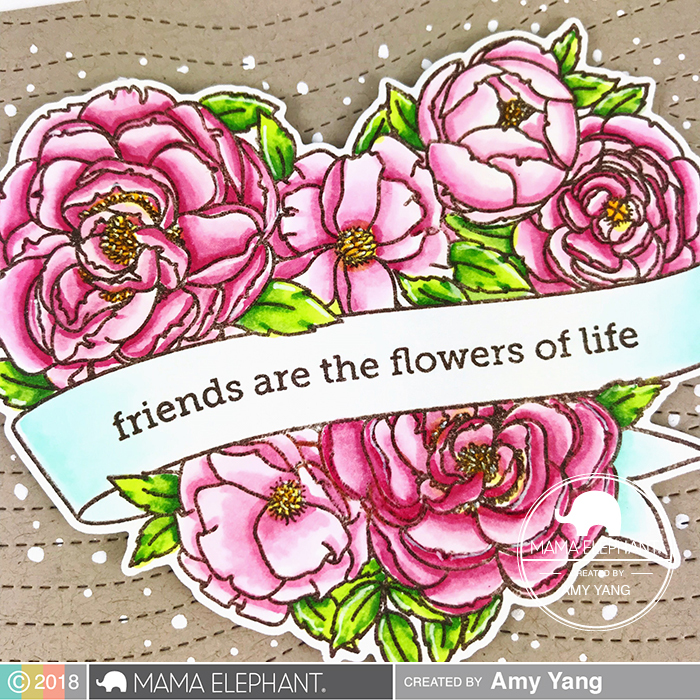 To begin, I Copic colored the beautiful arrangement of florals and cut it out with the Heart in Bloom Creative Cuts. The kraft front panel was die-cut with the Woodgrain Cover Creative Cuts and adhered it to a top folding A2 sized white card base. To finish, I foam mounted the colored image and added white dots around it with a gel pen. 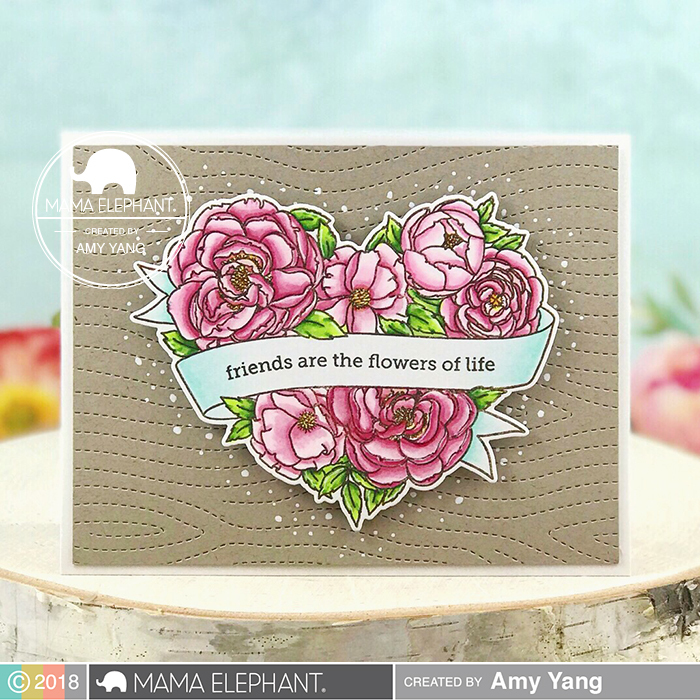 Visit the Mama Elephant blog to check out what the rest of the talented design team has come up with using the Heart in Bloom stamp sets. 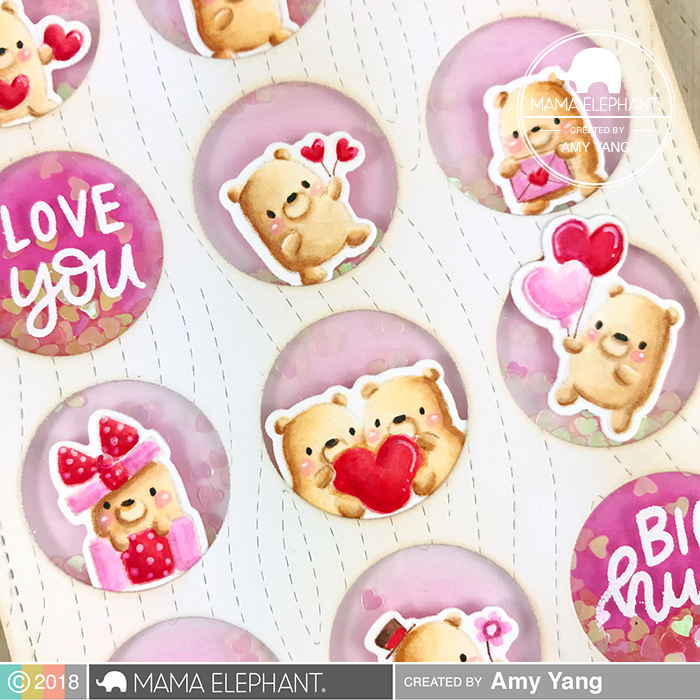 Hello and welcome to the Mama Elephant November release Stamp Highlight! 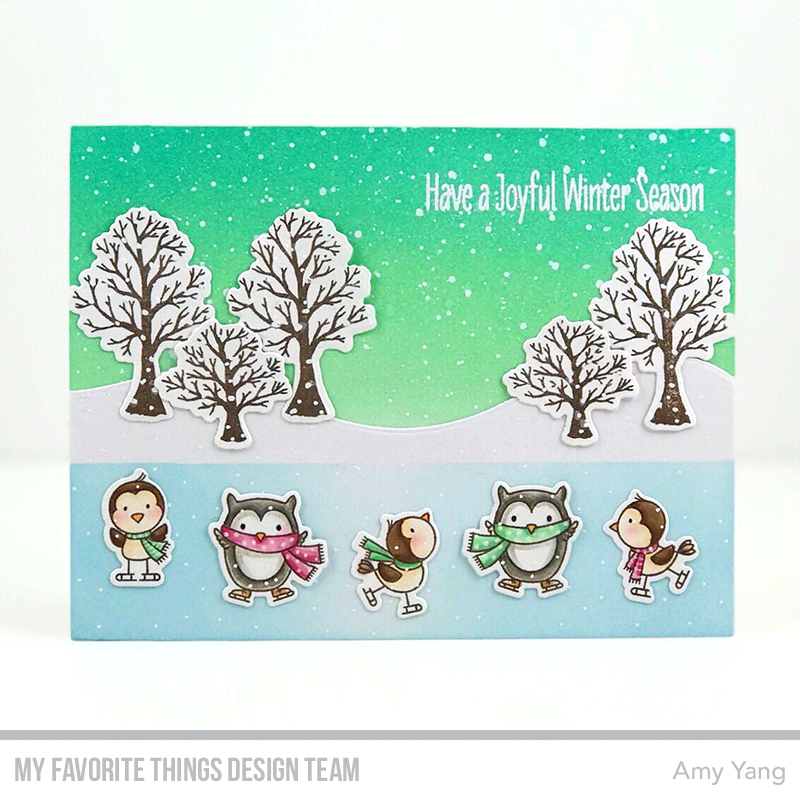 Today, the design team is highlighting the really cute Little Bear Agenda stamp set. To begin, I Copic colored the bears from the Little Bear Agenda stamp set ( I stamped it with brown ink for no-line coloring) and cut them out with the Little Bear Agenda Creative Cuts. The background was ink blended with Distress Oxides. Behind the sentiments, I used a darker color to make it stand out. The front panel was die-cut with the Woodgrain Cover Creative Cuts and the Circular Grid Creative Cuts. I used Vintage Photo Distress Oxide around the edges to add some color. I white heat embossed the sentiment on heat resistant acetate from the Wishful Taggins stamp set. After, I adhered it behind the front panel. Then, I added foam tape around the edges and the circles and mounted it to the background panel after adding the heart confettis. To finish, I adhered the colored bears inside the front circles. 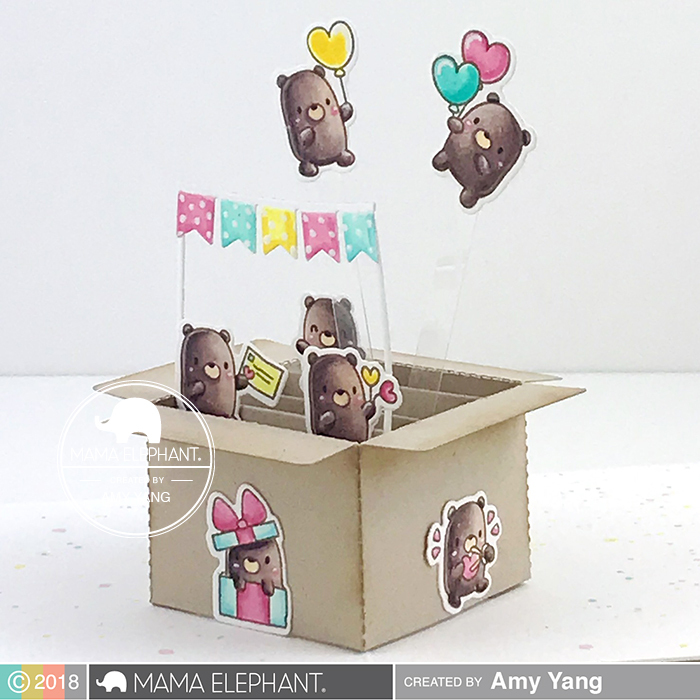 Visit the Mama Elephant blog to check out what the rest of the talented design team has come up with using the Little Bear Agenda stamp sets. 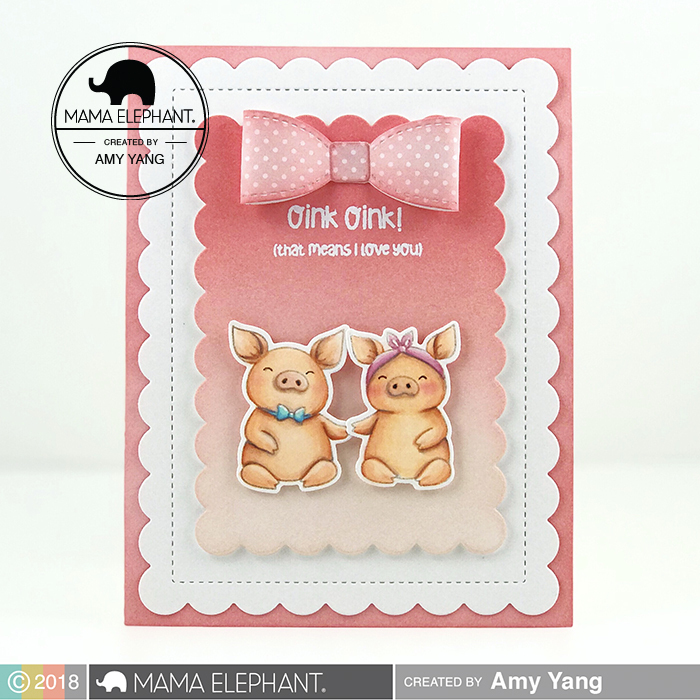 I have two cards to share with you today and it features the adorable Hogs and Kisses stamp set and the Framed Tags Waverly creative-cuts. 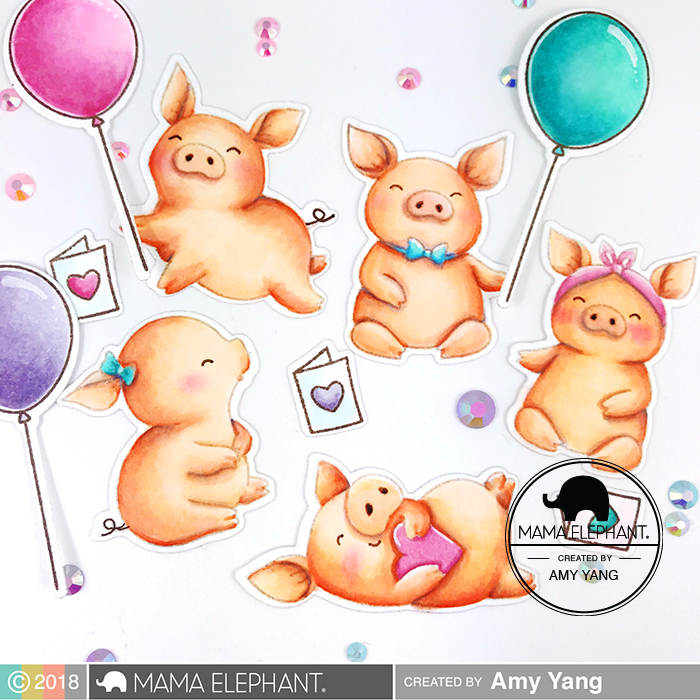 To begin, I Copic colored the entire set of the Hogs and Kisses stamp set and cut them out with the coordinating Hogs and Kisses creative cuts. The A2 sized back panel and the small scallop panel from the Framed Tags Waverly creative-cuts was ink blended with Distress Oxides. 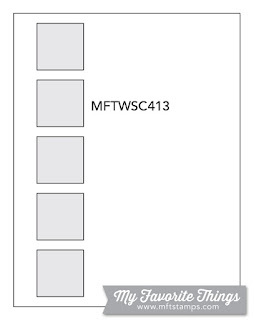 The white big scallop frame was die cut using the same set. On the front small scallop panel, I white heat embossed the sentiment from the Hogs and Kisses stamp set and added a cute bow I made using the dies from the Stitched Gift Tag creative cuts. To finish, I assembled the card and foam mounted the adorable colored pigs as shown. For the second card, I also ink blended the front panel with Distress Oxides. To add texture, I add splatters of water with a mini mister. Once it dried, I white heat embossed the sentiment from the Hogs and Kisses stamp set and glued on few sparking star sequins. For the front frame, I die-cut a white cardstock with the largest die from the Basic Rectangles creative cuts and then the small scallop frame from the Framed Tags Waverly creative-cuts. I foam mounted the framed to the front panel. To finish, I foam mounted the colored pig and the balloons as shown. Thank you so much for stopping by! I hope you enjoyed my projects. Hello there! 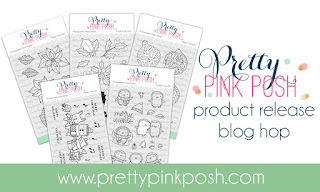 I'm so excited to be a guest designer for the Pretty Pink Posh November release! 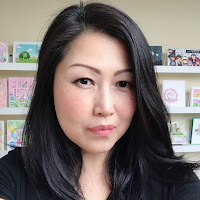 I have three fun cards to share with you today. 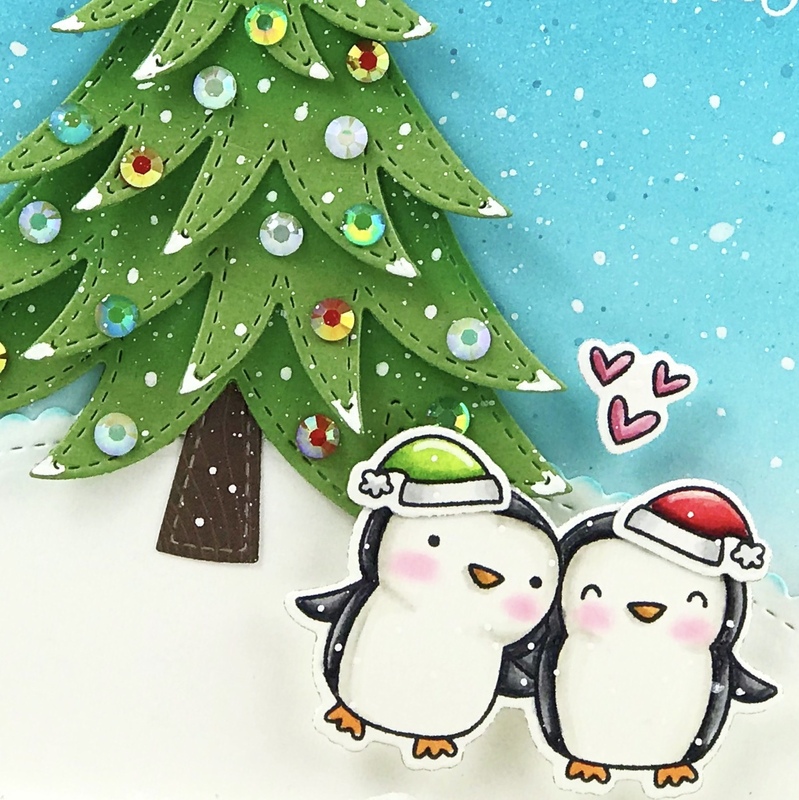 All three cards feature the adorable Penguin Pals stamp set, along with some of the other awesome products from this release that I'll share in more detail later. 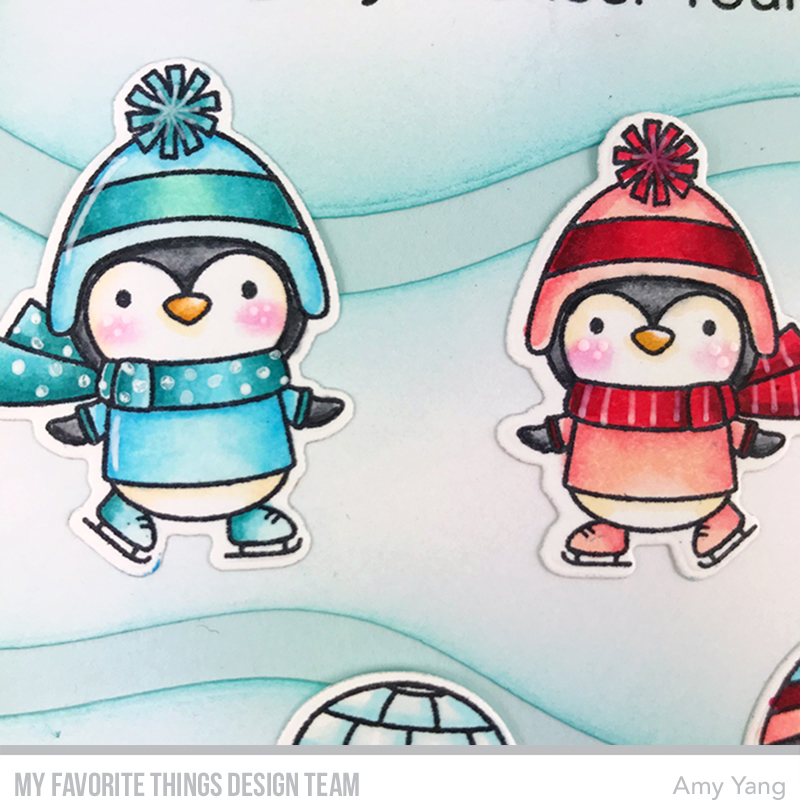 To begin, I Copic colored the stamped images from the Penguin Pals stamp set and cut them out with the coordinating Penguin Pals Dies. 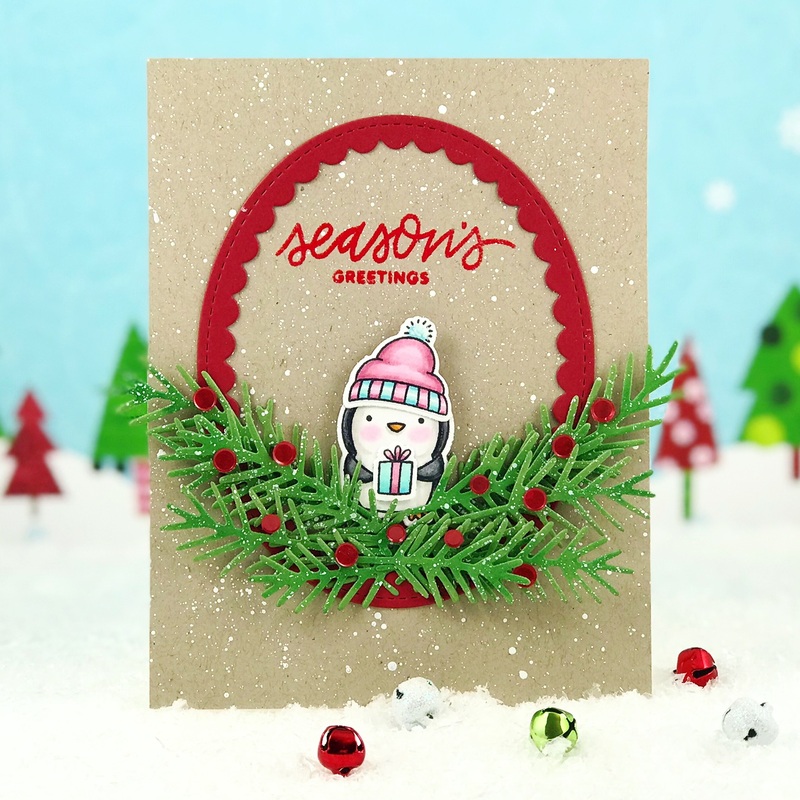 For the first card, I used trees from the Holiday Pals stamp set to help build my scene. I colored them with Copic markers and cut them out the Holiday Pals Dies. The front panel was ink blended with Distress Oxides. To add texture and snow to the sky, I added splatters of water and white paint. Once the panel dried, I glued on the Seasons Greetings Script from the November release. I used the cloud panel that I made using a die from the Stitched Borders 2 to make the ice skating area and the mounds of snow behind the trees. For the second card, I once again ink blended the front panel with Distress Oxides and added splatters of water, ink and white paint. 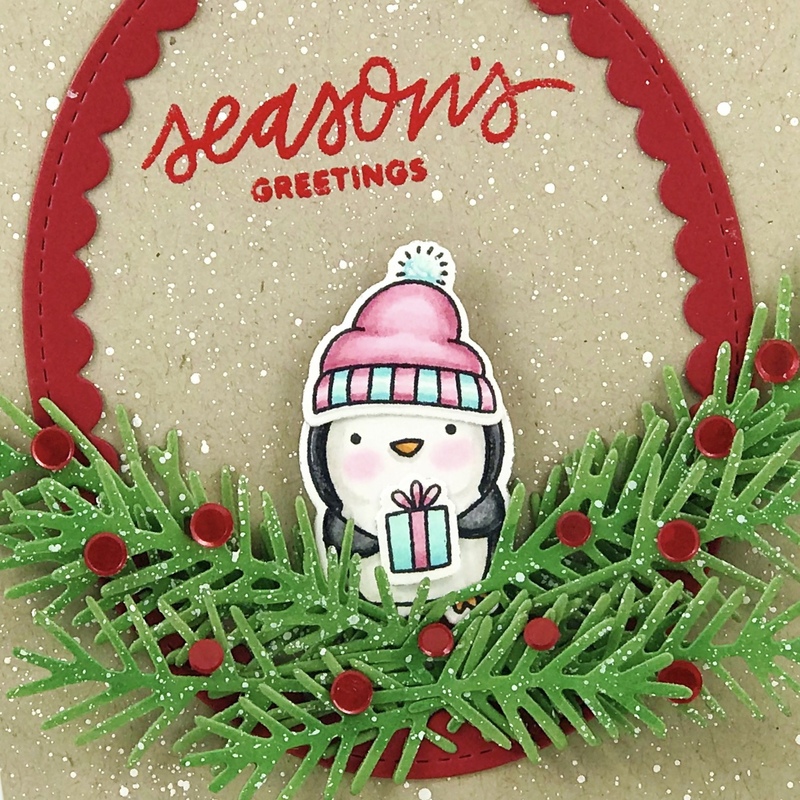 After, I white heat embossed the sentiment from the Penguin Pals stamp set. The tree was made using the Layered Tree dies. I decorated the tree using a mixture of the Starry Sky Jewels Mix and Holiday Jewels Mix. The front hill was die-cut with a die from Scallop Borders 2. I added snow to the images and the tree using a white gel pen. For the final card, I added splatters of white paint to the front panel. The sentiment from Christmas Friends was heat embossed in red. The frame was die-cut using the larger die from the Scallop Ovals Dies and adhered to the front panel. Then, I die-cut a whole bunch of pine sprigs using the Pine Sprigs Dies (I splattered them with white paint as well) and added them inside the oval as shown. For some color, I glued on the red confetti from the Berry Bright Confetti Mix.